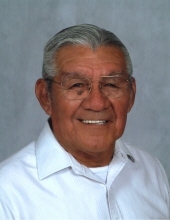 John E. “Pop” Mendoza, age 90, of Jacksonville, passed away Thursday, April 4, 2019 at his home surrounded by his family. John was born October 13, 1928 in Jacksonville to Ramon and Rosario (Vasquez) Mendoza. He served in the U.S. Army during the Korean War. He was a member of Our Lady of Sorrows Catholic Church and of the Knights of Columbus. He was preceded in death by his parents and his sister, Jessie Smith. Left to cherish his memory is his longtime-beloved companion, Mary Collins and a daughter, Kristina Mendoza Barrera; and his niece, Rose Ellen Washington. He is also survived by his granddaughters, Tiffany Kristen Dyess, Ashley Blu Mendoza Staats, Leslie Dyess Silverman; and his great-granddaughters: Tallulah Bingham, Tigerlily Bingham, John Fox Ward Lavalle, and Theadora Rose Staats. He lives behind many cousins, extended family and friends, and an entire community to whom he dedicated his life. Visitation will begin on Friday, April 5, 2019 at 6 p.m. and friends are cordially invited to visit with Pop’s family at Autry Funeral Home, Jacksonville. Recitation of the Holy Rosary will begin at 7 p.m.
A Mass of Christian Burial is scheduled at 10 o’clock in the morning, Saturday, April 6, 2019 at Our Lady of Sorrows Catholic Church in Jacksonville. Fr. Patrick Hartnett will officiate. Mr. Mendoza will be laid to rest in Jacksonville City Cemetery. Services are under the direction of Autry Funeral Home in Jacksonville. "Email Address" would like to share the life celebration of John E. "Pop" Mendoza. Click on the "link" to go to share a favorite memory or leave a condolence message for the family.